Alan Ayckbourn's latest play sees this most prolific of playwrights fire off yet another salvo of domestic dysfunctionality. Hero’s Welcome, set in a northern English town, treats his audience to tableaux of human misery staged as an end of the pier farce. Murray is a decorated soldier returning home from a conflict somewhere east of the Adriatic, to the town he'd fled nearly 20 years ago when he jilted the pregnant Alice at the altar. Time has seen Alice go on to marry Derek, a charmingly inadequate builder (and sensitively played by Russell Dixon) devoted to his model railway layout. Meanwhile, in a palatial house out on the hills, Brad (a former childhood buddy of Murray) has built his home, married to the desperately unhappy Kara. There's the smouldering ashes of a love triangle in here too and if all this seems familiar Ayckbourn territory, the playwright resolutely catapults us into the modern era introducing Baba, Murray's young and devoted wife displaced by war and who Murray has recently married during a tour of duty. Ayckbourn (much like Arthur Miller) dwells upon the human condition in his work. But where Miller applies a surgeon's scalpel to fillet out grief and emotion, Ayckbourn uses a chainsaw (or should that be shotgun?) to make his point. Whilst many of Hero's Welcome's themes are recognisable, by the time its characters have endured murder, arson (and for good measure, one of them suffers a debilitating stroke half way through act 2) the play's credibility has all but evaporated. That being said, Ayckbourn, who also directs, has assembled a marvellous ensemble. Richard Stacey's Murray is believable as the flawed warrior, whilst Elizabeth Boag's Alice cleverly hints at her once glamorous youth and an adulthood quietly spent in a marriage of disappointing compromise. As Brad, an absolute cardboard cutout of a morally bankrupt bounder, Stephen Billington sports the chiseled good looks demanded of his millionaire lifestyle - and whilst Ayckbourn offers him little more than crass cliché by way of dialog, he makes the most of it. Likewise, Emma Manton's Kara offers a thoughtful study in housebound misery. Though Manton's re-appearance towards the play's end, appallingly wigged and playing her daughter Simone, is stagecraft at its clumsiest. The centrepiece of this company however is Evelyn Hoskins' Baba. Hoskins (around whom, one suspects, the part may well have been written) brings an fragile, elfin stature to a woman wise beyond her years and who has witnessed life's horrors. 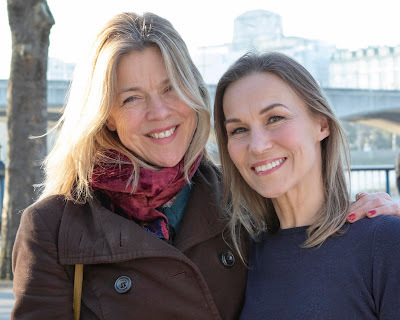 Hers is one of Ayckbourn's most well-conceived back-stories in a long while, with Hoskins defining the resolute determination and courage of a loving woman, desperate to re-build her life in the West. In a masterful turn from Hoskins we sense Baba's vulnerability yet admire her steely resolve. Aside from the litany of his character's woes, Ayckbourn seeks to comment on other social malaises, raising his scatter gun to take aim at the rise of gastro-pubs, binge drinking whilst all the while inviting us to laugh at other people's misfortunes. But Scarborough's literary hero is a canny chap and knows what entertains his devoted fan base. 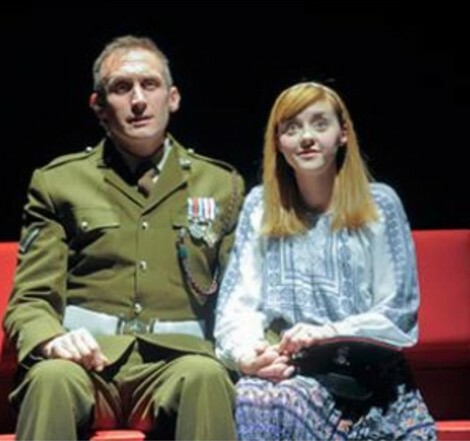 After a UK tour Ayckbourn’s company take the play to New York for a summer residency.